Remember that wire conservatory that I found for just dollars. For a soft touch..a lamp. I found this jar at WalMart and added my laundry soap. The scoup came from an old ice bucket. Do you decorate your laundry room? I would love to see it.. Awesome! I just started my laundrey room make over last week, I put some piccies up so you can go see! I love the sign....question would you be able to send to South africa? If not no worries. That's great but where is all of your stuff??!! Maybe that's the problem...I have too much stuff! 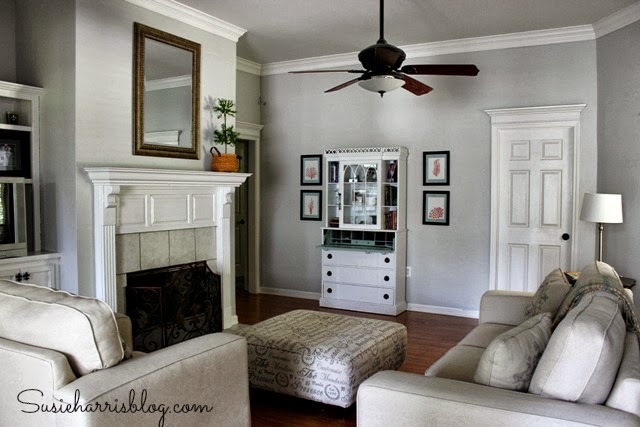 It really looks beautiful and a quick declutter would probably help mine! Love it! I redid my laundry room last spring and just last week revisited that makeover on my blog during the '2008 Top Projects' event hosted by Rhoda. Having a pretty laundry room makes a dreaded chore much more pleasant, doesn't it? I haven't done anything with the laundry room since we moved in but you've inspired me. I just may have to tackle it soon. Love the wash jar & the basket (I hate those plastic things too). My well loved cats share the laundry room ...their feed tray and litter boxes are located there. Have wall paper border of cats doing laundry...plus pictures on the wall of cats, cat figurines, etc. To cover the large door on the electrical switch box I made a collage of cats. I did this several years ago and have enjoyed since. I posted my laundry room today too! Great minds think alike. However, I'm just starting. Gave it a really good cleaning this weekend. I feel better already. That's beautiful! I wish mine could look that way. But my machines are in the unfinished side of my basement, surrounded by the heater, water heater, cat stuff, dog stuff, and a ton of other stuff. Nothing pretty. Nothing even a can of paint would fix. 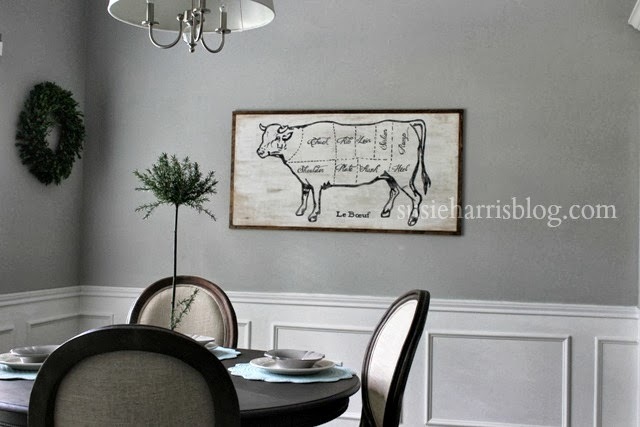 Until that day where we do something different, I will dream of a pretty room like yours! so funny! 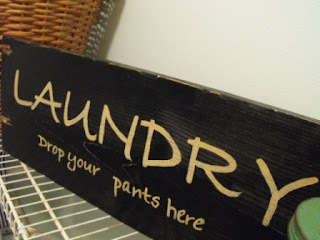 i just re-did my laundry room...in a blue...and i copied your laundry sign. [don't hate me]. it was so cute! So simple and pretty!!!! Looks like....no better... than a magazine layout!!! I love your signs too! I love it. The sign is perfect! I've been thinking about doing something about the laundry "closet" at the condo. You've inspired me to give it a try! I have a small laundry at home. I've accessorized it. Makes the chore of laundry a bit more fun! i would...but it's where the furnace and water heater are. it's literally the last room in the house to redo...and it's time is very near. maybe if i show this to hubs it will inspire him! woot woot! No, I don't decorate my laundry room. To me, it's just a room that holds my washer dryer, and has shelves with all kinds of supplies and hanging clothes. The door to the laundry room is always closed, so I don't really care about that room and would rather spend my time/money on the rest of the house. Very cute! mine needs a little help. Needs a new laundry tub and I am off to get a shoe organizer today. I have a closet to hide most and there is an old long shelf that could probably use a switch of decor:) Inspiration! That lamp I LOVE, where did you find that? I'm so glad I saw this today! I was just telling hubby the other day that I wanted to fix up or laundry room. There are so many creative things you can do to a laundry room. I'm looking forward to seeing what I can come up with! Your laundry room is fabulous. Very good job! I haven't...until now! What an inspirational post! I was inspired awhile back to decorate my laundry room. I just love having a lamp in there. It gives a nice soft light and makes me love doing laundry. Love the wash stickers. Well no I never thought of it but since I have seen so many that do I want to now...I actully went to Lowes to get me a cabinet to put in between my washer and dryer so I can start doing some little things as this...I did find me something to keep my liquid soap in but I will share when I get it all done...Love yours! Cute LR, Susie! and yes, mine is all dolled up in lime green, black & white. One of my favorite spaces in the house. I loved doing that room, first time I had a large LR, so I went crazy with it. I think you've seen it, but I do have pics posted of it all. Hi Suzie, this is adorable! I have been keeping up with your blog and girl you have been busy creating. I love all your wonderful posts, ideas and family pictures! Love it!! 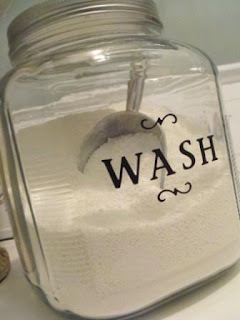 I love the "WASH" stickers on the jar! I'll have to do that. LOVE it all! I have that same jar and right now it has nothing in it. Now I know exactly what to put in it. I want to decorate my laundry room soooo bad. but first I want to rip out the two very random cabinets that are in there and put up open shelving. I have grand plans in my head...we'll see if they ever come to fruition. Oh yes...my laundry room was a labor of love. You can see it on my blog back in October...or it's on Rate My Space too..I have a link from my blog. 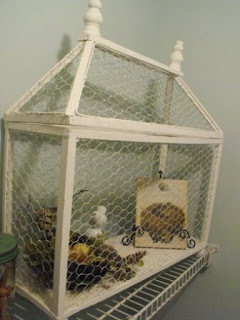 I just love your soft blue walls and I love that chicken wire conservatory! Your detergent jar is darling also. Well done! How funny, I have been working on my laundry room most of the day. :o) It serves a couple of purposes, so wanting it organized as such. Your laundry room feels relaxed and pretty! :o) Your pictures are great! 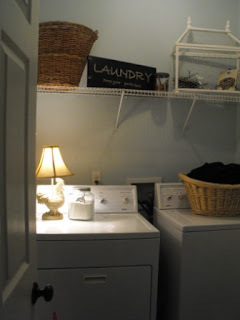 I would love to redo my laundry room. I might actually do laundry if I did! Yours is so pretty! Omigosh, now you have motivated me!!! I want to fix up my laundry room and make it cute!!! You have to go THRU it to the garage! THANKS for the fun idea!!! Love your room! I love the signs that you make and I am going to have to order one (or two). I also love the detergent container. What kind of letters did you use? You are just too cute! My laundry room sports lots of items that won't fit into my kitchen cabinets! Like...the crock pot, wok, blender, smoothie machine, etc.!!! It needs a redo--come visit, and we'll paint! Oh, it looks great!!! 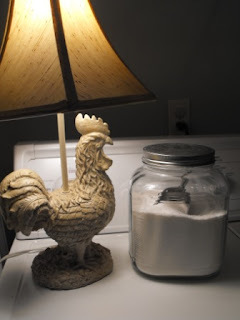 I love that laundry powder jar. Oh, and the sign is too cute. If you get a chance to stop by my place, I have asked a question of you that I would love to get your great opinion on. Oh, Dear Susie! Everything you do is loverly! I need to spiff my laundry room up! Maybe you could come and help me! Oh my goodness, that is gorgeous, as is everything you do. Just wanted to let you know you inspired me to try an initial canvas. Mine's not nearly as professional as yours, but I posted a pic on my blog. Thanks for the idea! P.S. I'm jealous of your laundry room, so cute! Love the lettering on your jar! 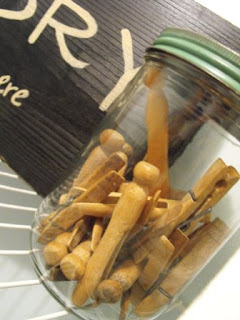 I have jars like that in my kitchen that aren't labeled, but you've given me an idea...thank you! It looks soooo much better than my laundry room! Mine is in need of a makeover...but I'm loath to start because it will be a PROJECT! 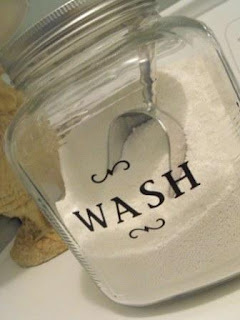 Never thought about adding letters to glass jars...that looks great!! Wish I had a laundry room, but all we have is a stackable washer/dryer in a space made only for it. 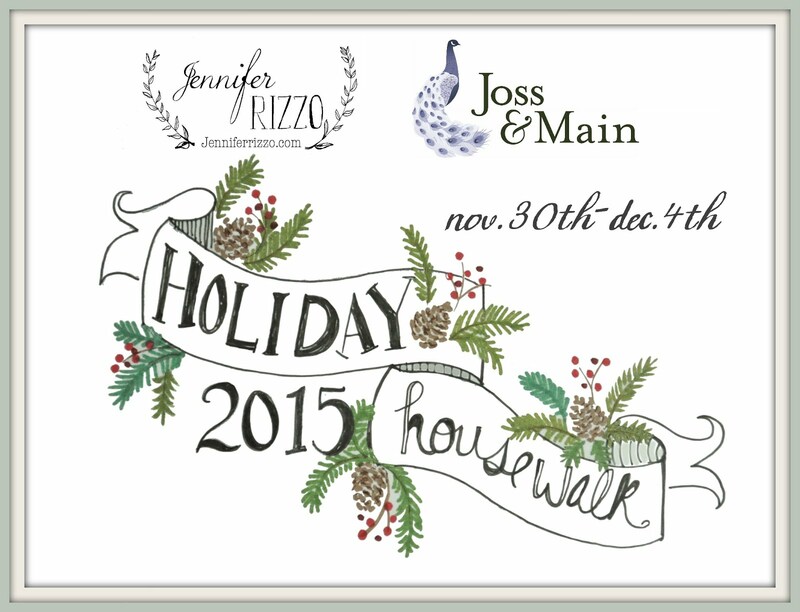 I'm having a GIVEAWAY over at my blog...so come on by and enter...it's a biggie!! 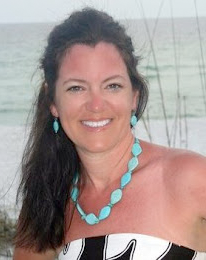 Great blog you have here...love your Etsy shop! And I'm working on my laundry room now! That's adorable. Unfortunately I have my washer and dryer in the dungeon. We live in a house built in 1911 that we love except for the dungeon. I just posted that I was going to somehow spiff her up. Great job. Oh it's lovely! I especially like your Grandmother's old jar. Your laundry room looks great. We did ours in beadboard. Love the letters on your laundry detergent jar. I was at Michael's today and they had that laundry basket for $3.99 with 40% off. For $2.39, I'm a "Susie wannabee". This is so cute. 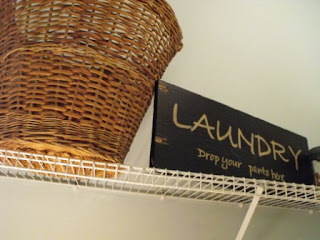 I'm gonna have to take some of these ideas and use them in my laundry room...too cute! I love what you did with yours! Beautiful inspiration! Thank you! 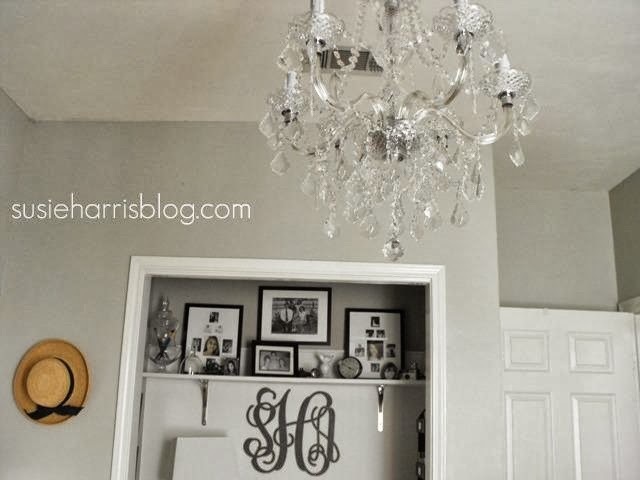 love your redo of the laundry room. 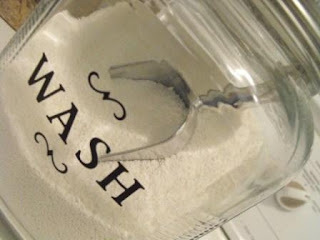 And the jar for wash powder is such a great idea. The wash soap is the BEST! That is just adorable! Some etsy love is happening over at my place! I just have to tell you that I have been dreaming of how I'm going to fix up my little laundry room ever since I saw this post! I'm so inspired!! The laundry room is the forgotten spot in my home. This was a creative transformation. Thanks for sharing. Hi Bienvenue! My name is Jess from Just a Blink. I just gave my laundry room an upheaval. I think even my dirty socks were about to revolt. 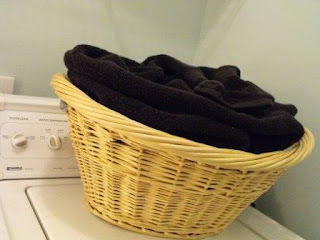 You can check out my laundry room post that I linked up to The Masked Mommy's Laundry Pow Wow. Casamodern provides you a good solution for Decorating Small Space in your home.